den September 27, 2016, 4:57 p.m.
On Monday night Donald Trump and Hillary Clinton faced off at Hofstra University on Long Island. For the first time during 2016's prolonged campaign, the candidates debated each other, and between now and November 8th the candidates are scheduled to meet two more times. Even by the standards of modern politics Monday's debate was fiery, with Trump often interrupting Clinton and Clinton drawing attention to Trump's history of controversial comments and actions. The latest research from YouGov US shows that most people who watched last night's debate say that Hillary Clinton won it. 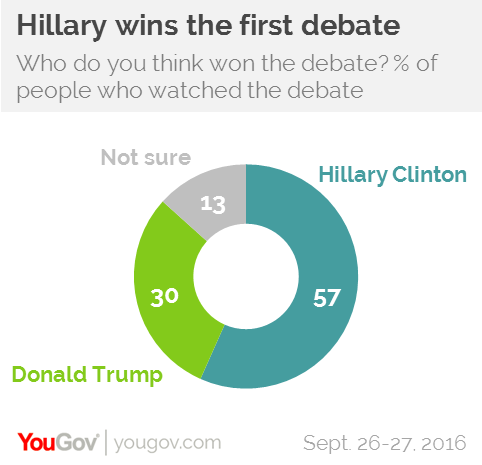 57% of Americans who watched the debate say that she won the debate, while 30% say that Donald Trump won the debate. 13% of viewers aren't sure who, exactly, came out on top.